A turboprop engine is a type of jet engine that is similar to a turbojet but that uses most of the energy from the hot exhaust gases to drive a propeller. In a typical turboprop, the jet core produces about 15 percent of the thrust while the propeller generates the remaining 85 percent. Instead of using as small a turbine as possible in order to obtain maximum thrust, as is the case with the turbojet, the turboprop engine employs as large a turbine as possible, for this is its main source of power. 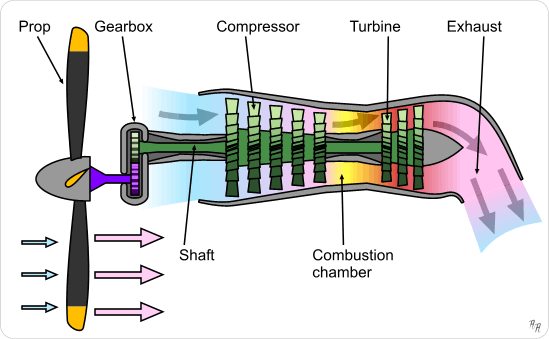 The layout of the turboprop engine is very similar to that of the turbojet, except that the turbine is more powerful and the shaft from the turbine, which drives the compressor, is extended right to the front of the engine to drive the propeller as well. Turboprop engines are more efficient than turbojets on designed to fly at speeds below about 800 kilometers per hour (500 mph). They are most commonly used on small and/or slow commuter aircraft, although some long-range turboprop planes are capable of cruising up to 925 kilometers per hour (575 mph). See also turbofan engine and ramjet.